You’ve made it through the long dash to the immigration, and then through the long queue there; customs are behind you, and now you are at the Narita Arrival Hall, and given the options of how to reach the city. There are actually at least 5 ways of which I can think: Private limousine or taxi; pick-up by a friend or company car; take the slow train; take the fast train; or take the airport-city bus. Ukai Toriyama, a photo by bloompy on Flickr. If I ever imagine a Japanese Eden it would be in the form of Ukai-Toriyama in Takao-san (Mt. Takao), a sprawling compound of lush greens and Japanese Maple trees, divided by creeks, united by bridges, and dotted with a multitude of pavilions, none of which has the same architectural design. From Here to Eternity . . . 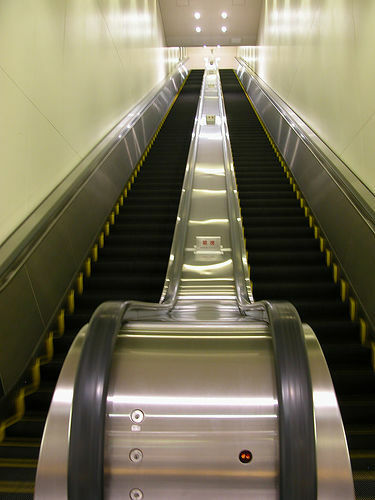 It may not look like it, but this Oedo-subway-line escalator at the Kokuritsu-kyogijo (by Sendagaya JR Train Station) seems to be one of the longest escalators I have ever seen in Japan, in the U.S., or in Europe. When you hop in it and stay put, it takes quite a while to reach the top (or the bottom). I actually started reading Tolstoy’s “War and Peace” at the bottom and finished it three steps before reaching the top. And I read that twice. Currently Tokyo is building its 13th line, somewhere down beneath the Meiji-dori (Meiji street), one of the busiest streets in the city. While that is not yet near completion, Oedo line will for the time being carry the title of “the last” subway to be built in Tokyo. The Shinjuku-2-chome Festival, a photo by bloompy on Flickr. Gay Pride Parade began in Tokyo a few years back, but about three years ago it stopped. I could only speculate why, as I have yet to find out the real reasons. Be that as it may, 2005 saw the rebirth of the Pride with a Lesbian & Gay Parade on Saturday (August 13) starting from and ending at the Yoyogi Park (which I unfortunately missed because of a food allergic reaction) and a festival today at the Shinjuku-2-chome, home to the local LGBT Tokyoites. 西日暮里 – Cemetery in Nishi Nippori, a photo by bloompy on Flickr. In January, my cousin who visited from Amsterdam went to the area of Tokyo called Nishi Nippori. 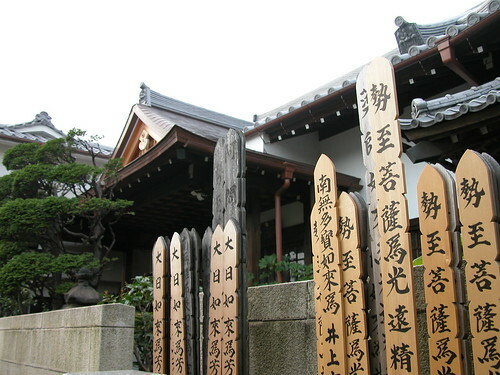 She recommended the place to me as she found the place tranquil and wonderful a site with many temples, shrines and houses preserved from the old time. I tried looking up the area in the guidebook and the Internet, but the former yielded nothing and the latter came up with only a scant result. So, equipped with nothing, I set out yesterday to go to the area blindly. 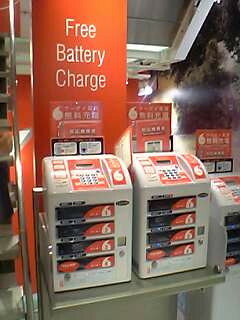 Convenience Everywhere!, a photo by bloompy on Flickr. I remember Japan as a land of gadgets: there is no end to what this country can invent. NRT-Landing Forms-Front, a photo by bloompy on Flickr. There was an article late in 2004 that said that Japan Immigration at the major airports like Narita will start taking digital photographs of visitors coming into the country, much like what the United States had started doing recently. Prior to my arrival at Narita today, I prepped myself while still airborne, making sure that no one would take a horrible mugshot of yours truly after 11 hours of flight. Since my travels to Europe in the 70s I have visited many public squares: in small towns and in big cities; during the fall, winter, spring, and summer; at dawn and near dusk, day and night. In my subsequent travels −after learning about the Greek agora and the Roman forum during college− I tried to recreate the feeling of being in that ancient marketplace, in that old public square. Did anybody ever stand and think that the very spot she or he stood on would one day be a subject of a study? What went on the mind of the people as they walked among the architectures that dwarfed them? In Nashville, Tennessee, stood the only standing replica of the Parthenon of Athens. While I was in college, many times I would visit the park where the monument stood and walked around the structure, but the feeling I was searching for eluded me.